We’re pleased to announce the release of one of the most requested features from our global client base. If you buy a ‘Higher’ contract, you will only win the payout if the exit spot is higher than the entry spot. 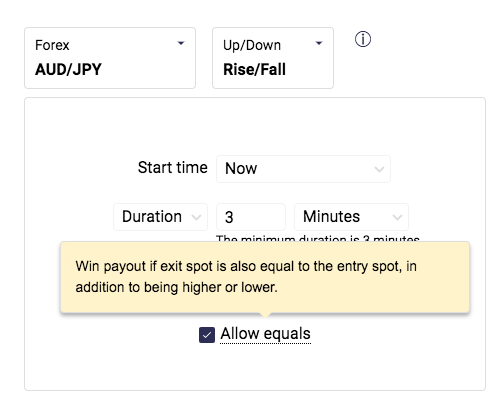 But if you “allow equals”, you will also win the payout if the exit spot is equal to the entry spot. The same goes for a ‘Lower’ contract when you “allow equals”. You will win the payout if the exit spot is lower than or equal to the entry spot. This feature is available now to Binary.com clients on Forex and Volatility Indices.